While the wooden boat model pictured here might seem like something created as a toy or a builder’s model, for the ancient Egyptians it actually was an important piece of religious and funerary equipment. Water played an important role in the ancient Egyptian’s daily lives, since the Nile River acted as a sort of ancient highway. Strong winds blew from north to south, allowing the swift and easy transportation of a variety of different things over long distances, including armies from Sudan to Palestine, luxury goods from East Africa and the Mediterranean, as well as every day trade staples such as grain, wine, beer and cattle. Additionally, due to the importance of the Nile River and its role in turning the harsh desert landscape into habitable farmlands, water transportation also had important spiritual significance as well. The ancient Egyptians were practical people and believed in equipping their tombs with many different types of tools to help get them to the afterworld. They desired to be reborn and live again alongside the god Osiris, king of the afterlife, who sailed the night sky. During the relative stability of the Middle Kingdom Period (between about 2000 to 1700 BC) the different types of tomb equipment grew rapidly, as the elite upper class gained more and more political power and economic status. The Egyptians believed in the idea of sympathetic magic, meaning that symbols and objects could be imbued with certain qualities; depending on how someone interacted with them, the user could take on some of those qualities themselves. Thus by reciting a few spells, an amulet could be worn by someone and help protect them, or a painting of food offerings on the wall of a tomb could magically function as sustenance in the afterworld. Wooden models that began appearing in the Middle Kingdom worked much the same way – it was thought that, no matter their size, they would magically become functional for the tomb owner in the afterlife. Small scale versions of granaries, breweries and butchers are just some of the wooden models that have been found in funerary contexts from this time period, including those of the Governor Meketre, on display at the Metropolitan Museum of Art. Wooden ships were also commonly found as models, and there are tombs that were filled with whole miniature fleets of them, like those of Governor Djehutynakht at the Museum of Fine Arts Boston. These include boats dedicated to domestic living, warfare, cooking and even a boat dedicated to brewing beer! These boats were not simply intended to provision the deceased tomb owner with food in the afterlife, but were instead meant to equip them for an important Nile River journey. Part of the understood religious obligation of the noble members of Egyptian society was to make a ritual voyage to the site of Abydos, which was believed to be the tomb of the god Osiris. So important was the journey that ancient Egyptian kings were found buried with full size boats alongside their pyramids. This trip was also meant to mimic the journey the deceased would take through the afterworld to join Osiris. Depicting the pilgrimage to Abydos as completed, both in tomb paintings and through the ship models, was meant to help ensure through sympathetic magic that the tomb owner would defeat all the potential dangers they would face journeying to the afterworld and arrive there safely as well. It also meant that there was less pressure for the tomb owner to make the actual journey while alive. Indeed, the tomb owner is often represented as a seated and stoic statue or a mummy, contrasting with the somewhat dynamic figures of the living crew manning the boat. By having the models, the owner received all the same benefits of having made the journey that he would have if he had done so while alive, without the investment of time or finances, which may not have been actually possible depending on their social status. The boat here in the collection at Cooper Hewitt represents a large traveling boat, the stern being slightly higher than the bow. Indicators of deck beams and the central wooden spine of the boat were painted on the deck, traces of which can still be seen. The mast on this model is missing, which would have been stowed in a forked support beam in the middle of the boat, along with real linen sails and rigging, to be “used” for the return journey. While there are model boats that had the sails raised, this model was manned with many different rowers, though some now missing, to propel the ship against the prevailing north wind; this indicates that they were traveling towards Abydos. Although this model wasn’t of the highest quality available, it still represents a significant piece of craftsmanship, which can be seen by the fact that each of the rowers was given individual characteristics; it likely belonged to a member of the noble class. The boat probably would have also been manned at both ends, with a potential helmsman, now missing, at the end of the boat steering, with the spoon shaped paddle as a rudder; the coxswain seen standing at the front would have held a weighted line used to determine if the river was deep enough for safe passage, and also helped the rowers keep time, perhaps through call and response chants, rhythmic clapping, or songs. The tomb owner could have stood at the head of the rowers, facing forward, or may have been included in an additional boat model, with this one only meant to transport working members of his household. With the importance that the ancient Egyptians placed on their religious lives, it should be no surprise to a modern audience that they wanted to carefully provision their tombs to safeguard not only the practical matters of food and shelter for the afterlife, but also for their spiritual well being. 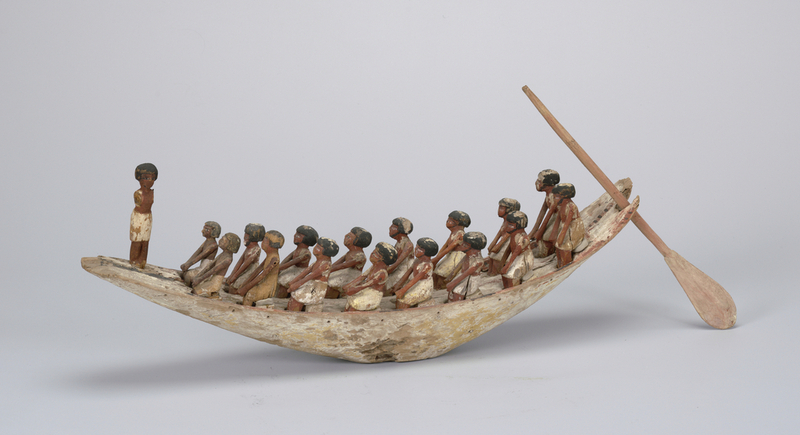 Since the Nile was the major geographical feature around which their entire society evolved, it makes sense that it featured so prominently in their sacred rituals as well, which is indicated by the detail, thought, and skill represented by these type of wooden boat models. Ava Forte Vitali is the Project Manager for the Mass Digitization Project at Cooper Hewitt. She has her Master’s in Egyptian Art and Archaeology from the Institute of Fine Arts, NYU, teaches Introduction to Egyptian Art at Adelphi University and has a regular lecture series at the Morbid Anatomy Museum on Death and the Occult in the Ancient World. She previously worked in collection management for Greek and Roman Art at the Metropolitan Museum of Art. Casson, Lionel. Ships and Seamanship in the Ancient World. Princeton University Press, 1971. Freed, Rita E., ed. The Secrets of Tomb 10A: 2000 BC. Museum of Fine Arts Boston, 2009. Jones, d. Model Boats from the Tomb of Tutankhamun. Griffith Institute, 1990. Vinson, Steve. Egyptian Boats and Ships. Shire Publications, 2008. Winlock,H.E. Models of Family Life in Ancient Egypt from the Tomb of Meket-Re at Thebes. Harvard University Press, 1955. Excavations throughout Met History, Tombs of Meketre and Wah: http://www.metmuseum.org/met-around-the-world/?page=10157.